Arusha is the closest city to Kilimanjaro International Airport and an Arusha Safari is a great introduction to Tanzania wildlife. 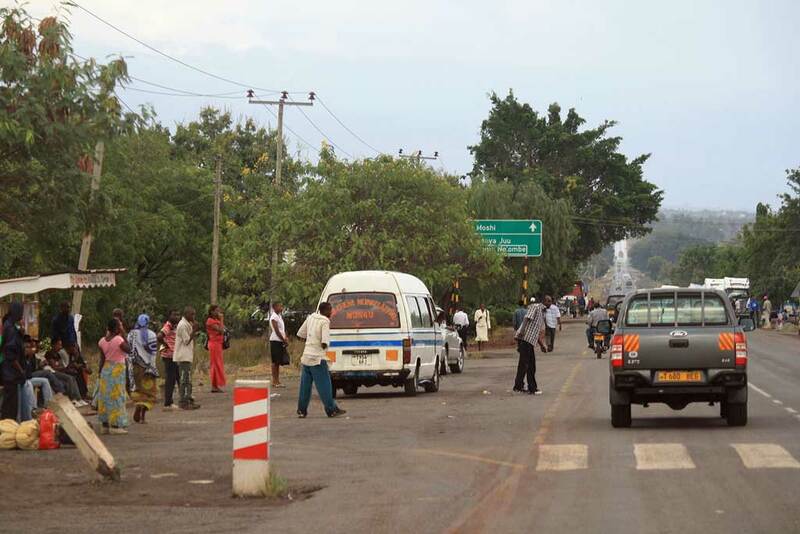 It’s a short drive from the Arusha to Arusha National Park. Unfortunately, the high population density around the park means that you will not be seeing any lions, cheetahs, leopards or rhinos. 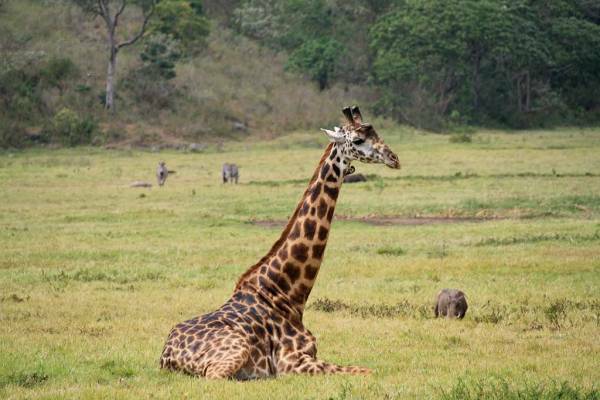 It’s an exciting beginner’s safari, but once you visit the Serengeti, Arusha National Park won’t seem up to par any more. Not having a visa in advance turned out to be a huge time delay at the airport. I thought that having all our bags with us would put us first in the visa line, but that wasn’t the case. Two staff handled a myriad of tourists who huddled in a mass, pushing and shoving to be served first. Luckily I brought the completed application form along, as it had to be submitted. A man wandered through the group taking large groups of applications, provided that $50US per person was also handed to him. He then took the paperwork and funds behind the counter where a third person processed these. When we finally received our visa, we walked forward to a sign that said “Nothing to declare”. By choosing his route we were immediately outside without going through customs. Our guide from Arumeru was waiting for us. He introduced himself as PJ (Paul John). Viki remembered we has missed the currency exchange which was quite straight forward, except that they don’t count the currency. It’s understandable though when you get more than 1,000 Tanzanian shillings to the dollar. They simply hand you funds in set bundles, which they feel are self explanatory. PJ was an extremely friendly person who spoke reasonable English and we thoroughly enjoyed our time with him. He had been a mechanic with Arumeru for more than 10 years and had trained to become a guide. Vehicle repair experience is required of all licensed guides in Tanzania. The late night drive to Arusha reminded me somewhat of late night travel in Mexico. We came upon vehicles with no tail lights and trucks traveling about 5 miles an hour. At one point a broken down truck was abandoned in the middle of the road with a few broken branches set in front of it as a warning to oncoming traffic. Speed bumps and speed “humps” are very popular on major thoroughfares. There were numerous bumps and humps between the airport and Arusha. The pattern seems to be that for any populated area along the route, you should place 3 sets of speed bumps, a large hump and then 3 more speed bumps. We also noticed a lot of people walking along the road side at night. It was a bit confusing to adjust to driving on the left hand side of the road too. We arrived at the Impala Hotel after 10 pm. In the morning we ate at the buffet breakfast, which is common for safari tourists. PJ arrived right on time and we set out on our Arusha Safari to Arusha National Park. The short drive to the park along the highway showed a common pattern for Tanzania. There were scores of people along both sides of the road. They are too poor to own bikes or cars, so they walk with loads on their heads or pull loads on two wheeled carts or wooden wheelbarrows. The roads are the life blood of the people and seem to coincidentally accommodate vehicles. Many people were dressed for church, because it was Sunday. Most people in Tanzania are Christian due to the influence of European missionaries and also due to a distain for Arabs, because of Arab involvement in the slave trade on the coast. A short drive off the main road took us to the park and a completely different world. Clouds obscured Mount Meru, but the temperature was perfect. The cloud cover reduced the heat. As with all national parks in Tanzania, there was lengthy paperwork to enter. 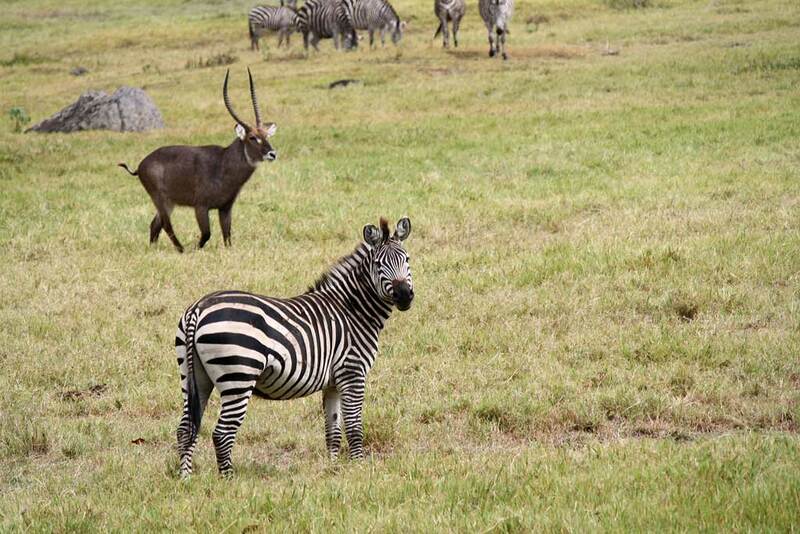 It was only a mile or so into the park before our Arusha Safari provided the excitement of our first Tanzanian wildlife. 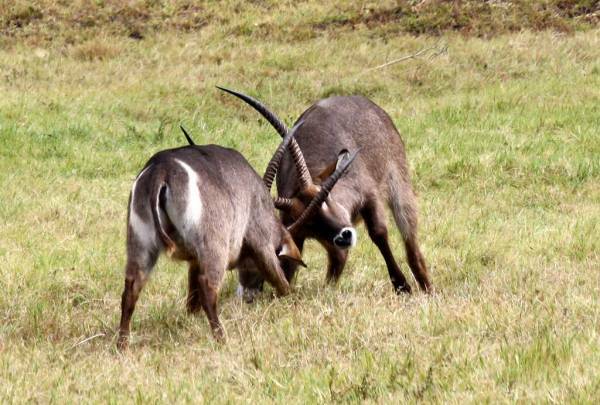 There is a mini Serengeti grassland in the park, which provideds close views of numerous animals. The wildlife viewing was thrilling. 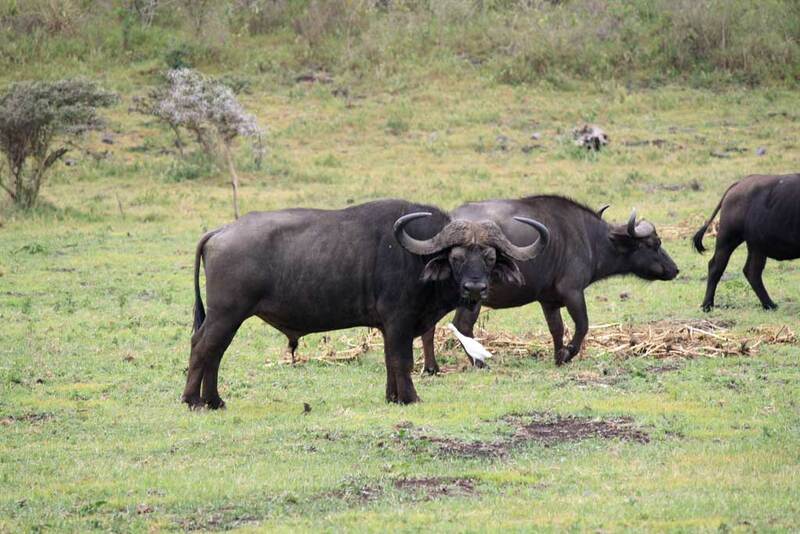 Zebras, wart hogs, guinea fowl, baboons, water buck and cape buffalo (also known as African buffalo but not to be confused with water buffalo) were easy to see. We watched two zebras harassing each other in a play fight. They wrestled until they both fell to the ground and still kept at each other while down. 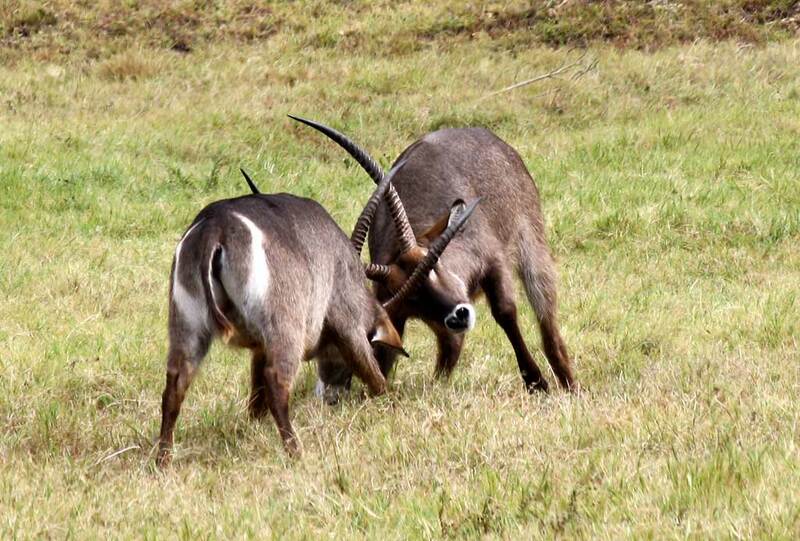 Two of the water buck were sparring and you could hear the clash and echo of their antlers. While we watched, PJ noticed motion in the trees behind us. Four giraffes we grazing. A most impressive start to the day! 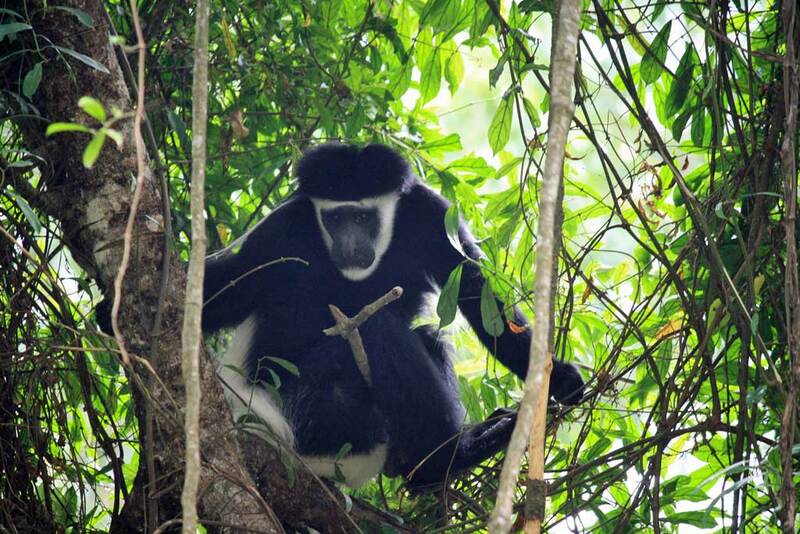 PJ took us through the forest area next, where we spotted some Colobus monkeys. We then went down to Momella Lakes, where there was abundant bird life. 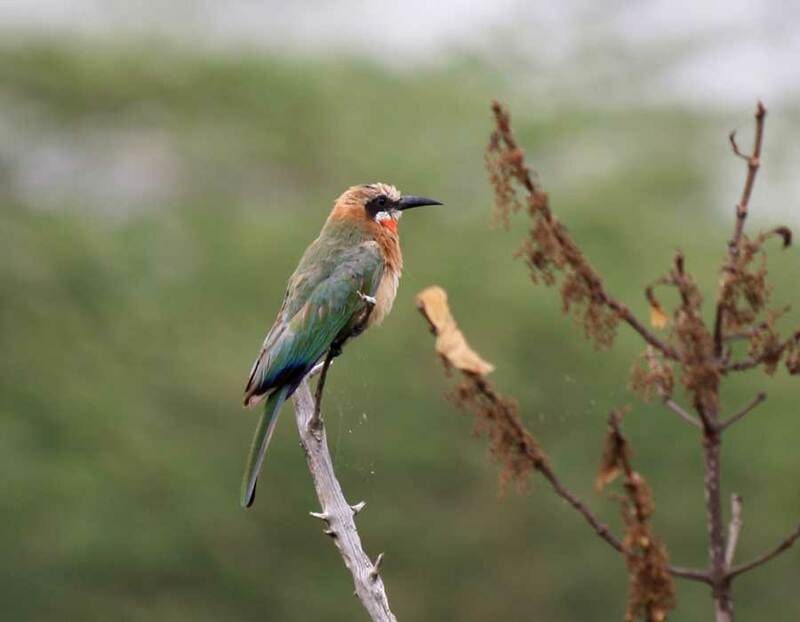 It wasn’t until I visited Tanzania that I became aware of the large number of birds there. An African bee-eater perched on some brush made for a great photo. In the distance, on the lake, you could just make out the back of a hippo that was repeatedly submerging. We drove past Momella Lakes and it became very sunny. 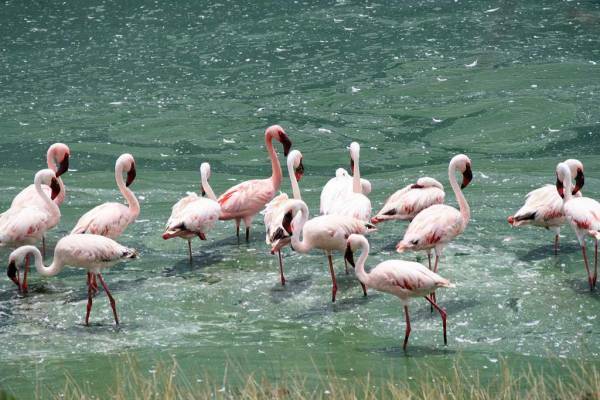 A large number of greater flamingos rimmed the edges of small alkaline lakes . Greater flamingos are whiter than lesser flamingos, but show a nice burst of pink when they flutter their wings. It was pleasant to turn off the vehicle and listen to the constant murmuring of these birds. We returned to Momella Lakes for our first safari box lunch. Unfortunately we would experience many more of these. Viki avoided the chicken wrapped in cellophane and the wrapped cut veggies. The standard in a safari box lunch always contains a hard boiled egg, a juice box and a small bottle of water. Some form of bread and cookies are typical too. This one turned out to be somewhat atypical, as it had skewered deep fried potato balls. During lunch, yellow weavers came by to beg food. Yellow weavers are intriguing, not for their bright yellow, but for the way they weave strips of vegetation into a round nest with an entry passage at the bottom. They spend quite a bit of time upside down with long strands of plants in their beaks, which they effectively sew into the ever expanding structure. It became apparent that identification of bird species was a major responsibility of guides and a personal interest for PJ. After lunch we got close to a turtle, known as a leopard turtle, and also to a reed buck. We saw several more giraffes, including a young one who kept adorably twisting and turning its neck against its mother’s. Next PJ drove us up on to the crater rim just south of Mount Meru. At the rim we could see a mini Ngorongoro Crater with views of cape buffalo herds, zebras and a band of baboons on the move. The rains were returning but the mood was calm and peaceful. On the way out PJ noticed elephant dung on the road. He indicated that elephants were extremely shy in Arusha National Park. They are unpopular with those who grow crops outside the park, as elephants like to make night time crop raids. We eventually came full circle to the mini Serengeti plain and had a special treat waiting for us there. The 4 giraffes that we had seen earlier in the trees had moved on to the plain. All of them were lying down. This peaceful scene of giraffes, cape buffalo, zebras, water hogs, water buck and baboons was the highlight of the day. The absence of lions in the park caused a unique harmony and ease among the animals. I asked PJ whether there had ever been lions in the park. Sadly he indicated that the last time he’d seen rhino or lion in the park was about 20 years ago. Herders kill lions to prevent attacks on cattle. Poachers kill rhino for their horns. So, neither can survive in populated areas. PJ seemed even more moved by the scene then we were. I’d etched it in my mind. PJ seemed unable to leave. His mood was touching. PJ next drove us to the Kilimanjaro Mountain Resort at the base of Kilimanjaro. On the way we convinced him to let us buy him a soda. He selected the location very carefully. The road side cafe had tables and chairs arranged under shade trees. Viki and I were the only Caucasians, which was a unique moment on the trip. 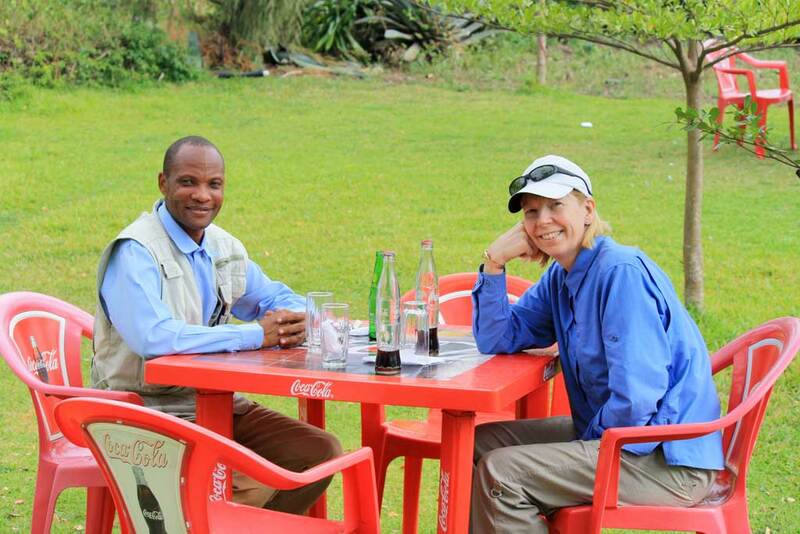 For the rest of our time on safari there would be no blacks sitting with us during our meals. PJ had a Krest bitter lemon. We had to cover our sodas to prevent bees from entering the bottles. PJ’s gentle nature toward the bees was remarkable. When one flew into his bottle, he tipped it until the bee flew out. A bee got swamped in PJ’s open glass, so he used a bottle cap to gently free it. PJ gently brushed the bees away from his face and hands. When it came time to pay the bill, we were shocked. The charge was one quarter what it was in hotels. The waitress was ecstatic with her tip. The trip to Kili was sobering. 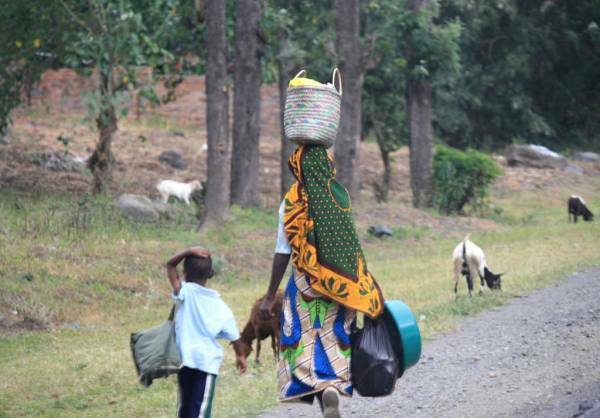 There was unimaginable poverty and the route was full of people walking or carting goods. Bicycles are rare because they are too expensive. I’d seen poverty like this in the Middle East, but it was only a component of the society there, while here it was pervasive. I felt a sense of despair at being totally incapable of helping in any significant way. The opulence of the Kilimanjaro Mountain Resort served to make me feel awkward and out of touch with the extreme poverty in Tanzania. My perception turned out to be unfounded though. I soon learned that the Tanzanian people are the friendliest in the world and are accepting of everyone. Next Stop – Marangu Safari.